Synaptic Puzzles to enhance mental flexibility. Each rectangle contains either a battery with a positive (+) and negative (–) pole OR a dud wooden block which does nothing. The numbers along the top and left indicate how many positive poles there are in that row or column; likewise for the other numbers showing the number of negative poles. A detective cartoon strip incorporating a taxing problem, based on the tales of Sherlock Holmes by Conan Doyle. 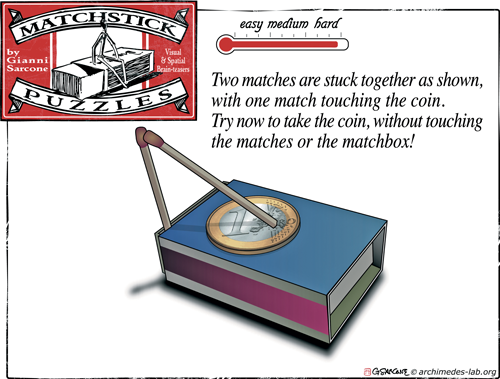 Entertaining and perplexing rope puzzles. Uncover plots, reveal murderers, unmask liars and recover stolen goods, as you complete these lively logic puzzles, codes, anagrams, number puzzles, and of course, who dunits. Use your deductive powers to right wrongs and prevent crimes, while you deal with the esteemed Inspector Lestrade of Scotland Yard, Mrs. Hudson, Holmes’ household manager, and all the other characters you’ll encounter in and around 221B Baker Street. Complete the grid so that each row and column contains a red, orange and green light. The lights at the end of each column and row tell you the colour of the red light you will meet if you travel in that direction down the column or row. You have four shots in which to get your golf ball upwards from the tee to the hole. Choose one each from the Drive, Iron, Chip and Putt selections. Each shot goes straight from the starting to finishing square. Only one combination will get you in the hole and you may never land o the grid, in a tree or in a bunker. Complete the grid so that every row and column, and every outlined area, contains the letters A to G.
Which two of these block piles could be tted neatly together to make a perfect 3 x 3 x 3 cube? Weekly puzzle problems devised David J. Bodycombe, Games consultant and puzzle writer; currently Question Editor for BBC4's Only Connect and author of Penguin Sudoku books.